The solution was as simple as it was improbable: cover rafts with plants, and set them afloat in the lake. Within a year-and-a-half, the algal blooms were gone. Water clarity improved. Oxygen levels rose. Today, the lake is home to a thriving community of fish, including black crappie, yellow perchand Yellowstone cutthroat trout. The story of Fish Fry Lake demonstrates the power of mimicking wetlands to clean up dirty waterways. Wetlands are sometimes called nature’s own water purifiers: as dirty water moves through a sprawling marsh, the bacteria that cling to wetland plants, timber, rocks, and other debris consume and process some common water pollutants. Other contaminants get trapped in the mud and muck. As result of these and other processes, the water that eventually flows out of a wetland is much cleaner than the stream that came trickling in. To construct a BioHaven island, the company starts with layers of mesh made from recycled plastic. They assemble this mesh into a floating raft – which can be as small as a home aquarium or nearly as large as a football field – and top it with soil and plants. They launch the island into a lake, pond, stream, or lagoon, anchoring it in place. Over time, the plants’ roots grow into and through the raft’s porous matrix, descending into the water below. At the same time, bacteria colonise the island, assembling into sticky, slimy sheets called biofilm that coat the floating matrix and the suspended plant roots. The system also mechanically filters out other pollutants, like metals and particulates. “The sticky biofilm essentially keeps the water clear because all the suspended solids tend to bond to it,” says Kania. 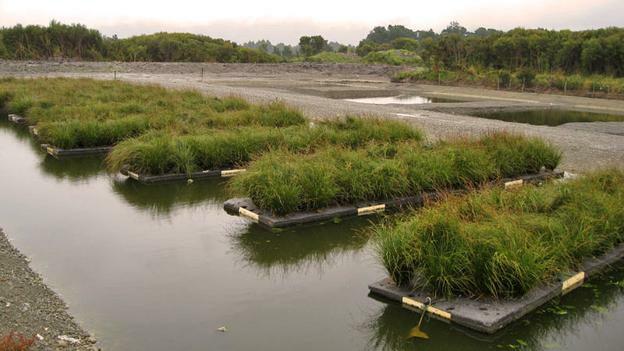 Floating Island International, which has deployed more than 4,400 of their artificial wetland systems worldwide, has documented this effect in multiple case studies. For example, the concentrations of suspended solids, copper, lead, zinc, and oil and grease fell dramatically after a floating island was installed in a stormwater pond in Montana. Controlled laboratory studies and research by scientists not affiliated with the company have also foundthat floating treatment wetlands can reduce the levels of many common water pollutants.